LAWRENCE — Take a country drive in Kansas on an early spring evening, and you may witness the otherworldly sight of prairie fires. Controlled, or prescribed burns, mimic the means by which natural forces—and later Native Americans—maintained the prairie ecosystem. Over the next few days, research staff of the Kansas Biological Survey and the KU Field Station are conducting prescribed burns in several areas of the Field Station and on the Lawrence campus. The burns began late last week at KU’s Prairie Acre, just down the hill from Watson Library. The burn regimen is part of the Prairie Acre Restoration Project, a joint project among the KU Center for Sustainability, the Environmental Studies Program and the Kansas Biological Survey. Support for the restoration project has come from the Douglas County Community Foundation's Elizabeth Schultz Environmental Fund and other private sources. Burning continued at the Field Station’s core area just north of Lawrence, with operations staged from the Research and Operations Center, including the Armitage Education Center. Announcement of each burn takes place on short notice, which is typical for prescribed burns. A permit from the county must be obtained for every burn and is issued the day of the burn. The burns are critical for maintenance of areas upon which many research studies depend. research projects at the Field Station requiring burning as a part of their scientific protocol. Burning also takes place at the Field Station’s Anderson County Prairie Preserve about 60 miles south of Lawrence. The 1,450-acre preserve is owned by the Nature Conservancy and maintained by the Biological Survey as part of the KU Field Station for university research projects. Staff members will burn several hundred acres there. Each crew is made up of eight to 10 people from the Kansas Biological Survey. Several vehicles with water tanks are used to follow the highest standards of safety. Daily operation and maintenance of the entire 3,800-acre KU Field Station is a complex, varied and ever-changing responsibility managed by three people. Operations Manager Bruce Johanning and Research Associate Vaughn Salisbury have managed burns for many years. Parsons joined the Field Station staff at the beginning of this year after managing field experiments of Bryan Foster, professor of ecology & evolutionary biology, and greenhouse experiments of Jim Bever, Foundation Distinguished Professor of Ecology & Evolutionary Biology. Both Foster and Bever hold joint appointments as senior scientists at the Kansas Biological Survey and work from laboratories at the survey offices in KU's West District. 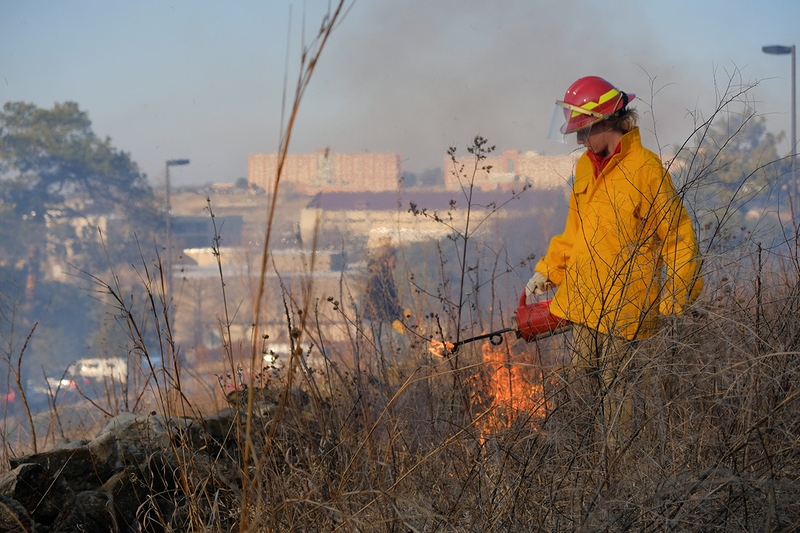 Photo: Kansas Biological Survey and KU Field Station staff carry out a prescribed burn at the Prairie Acre on campus. Credit: Andy White, KU Marketing Communications.